There are few things people take more seriously than coffee. It’s one of life’s simple pleasures! Even if you aren’t a regular coffee drinker, chances are someone is on your holiday list who’d appreciate one of our holiday coffee gifts! The gift of coffee is always appreciated, yet picking the perfect roast isn’t always easy. But no worries, we’ve done the shopping for you! The Falling Rock Café and Bookstore has our single origin and classic coffee blends, as well as limited edition holiday flavors from Great Lakes Coffee Company—hand roasted in Michigan’s Upper Peninsula—that all make great gifts! Another great holiday gift when shopping for that special friend or family member is a Falling Rock Café Lifetime Membership in our Mug Club. The Lifetime Membership is available to anyone from anywhere in the world… and believe me, we have an international mug club! 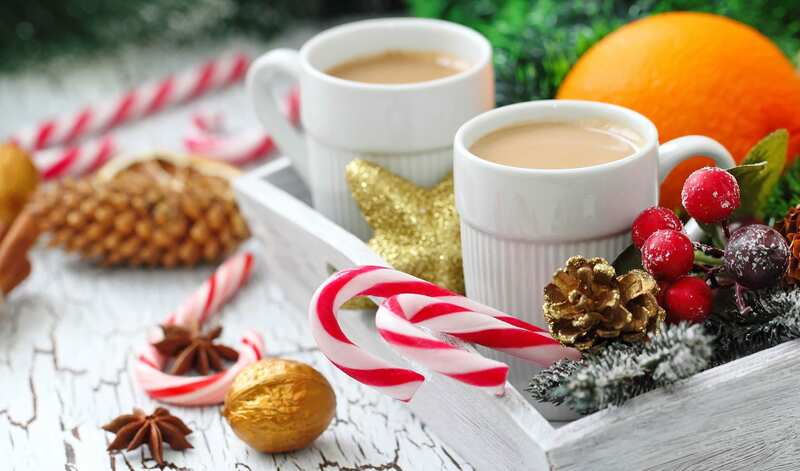 The one-time, life membership fee is $50.00, and with it comes delicious brewed coffee made to order from a regional roaster, teas of all kinds, and hot chocolate. A gift certificate will be mailed to the recipient acknowledging the date of purchase and member’s name and mug number. Members are then charged only $1.00 when visiting our café for unlimited refills. We found that our coffee is inherently what connects people to the Falling Rock Cafe, so we created Great Lakes Coffee Company with the goal of bringing the finest, freshest coffees from around the world to the Upper Peninsula. We started the coffee company back in 2002 when we first bought the building, and incorporated the name Great Lakes Coffee Company because we became so enamored with the area ever since we bought our cabin on Powell Lake in 2001. We wanted to name our coffees after the places we began to love so much, and the Captain Dan’s name came from a former Great Lakes Coffee Co. partner we had early on in business. She named it after her husband Dan, who passed away suddenly. He loved Lake Superior, was an avid outdoorsman, and skied in the Noquemenon race. He had true grit and loved dark roast, so it was only fitting to name our Espresso after him. 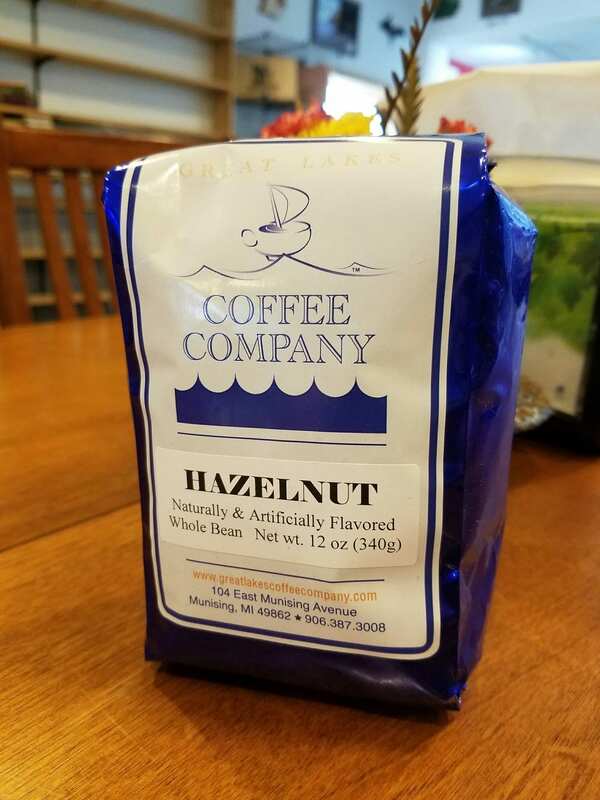 We buy our coffee from a father-son team based in Escanaba, with the exception of our flavored coffees which we buy from the northern Lower Peninsula of Michigan. We replaced our Ambex roaster with a Diedrich coffee roaster in June of 2016 and will continue to use that brand for future use. They are great machines! 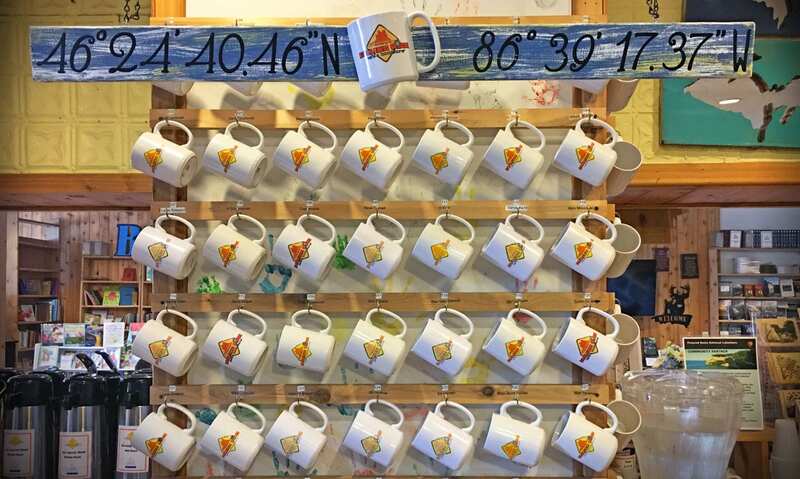 The Falling Rock Café and Bookstore is a big supporter of Michigan made products and gifts and is committed to celebrating all that is great about Michigan, and encouraging others to share in its bounty! Our beautiful state is full of gifted, talented and hard-working people who produce outstanding goods and merchandise; many of whom run their own cottage industries and, in many cases, are literally working out of their own homes. Please support your local communities by shopping at small businesses this holiday season! When you’re thinking about gift giving, there’s no better way to show your gratitude and appreciation for friends, family and the entire community than by shopping local for the holidays.